Yes, I based the title off the folder that LBK refers to. Post your schlock icons in this thread! Orthodox and non-Orthodox alike are more than welcome. I'll start. At least it's not as bad as the ones with Christ holding the (aborted?) anatomically correct fetus. Yikessssssssssss !!!!!!!!!! I am running awayyyyyyyyyyyyyyyyyyyyyyyyyyyyyyyyyyyyyyy.. The "Lord of the Dance" one is horrendous. Is someone trying to tempt me into posting my archive of schlock? What's truly disturbing is that a good chunk of what I have on file has been produced by people who are Orthodox, and only some of it is in honest ignorance. Come now and spiritually edify all of us with this treasury! I am not sure what a Schlock icon is??? I just did like 10 but I think i accidently left the page, now I have to do them over again. I am all for freedom of expression. I am also all for putting Robert Lentz in jail forever, with no painting supplies. One of my favorite "Schlock Icons"
The same goes for his protege, the Jesuit priest William Hart McNichols. And the Orthodox priest Stamatios Skliris deserves to be locked in a room full of babushki and yiayies, not to be released until he repents of his crimes against iconography. It'll make any hauling before a bishop seem like a pleasant outing. Oh please, please, don't hold back. And supply photographic examples. That's what this threat is for! painted as a gift for my daughter, author of the "Lost Voices" trilogy of young adult novels about contemporary teenage mermaids. According to Irish Legend, Li Ban, a king's daughter, was one of the few survivors of a great flood that occurred before the arrival of Saint Patrick. baptized as a Christian. Rather than live as a mermaid for another 300 years, Li Ban chose to die and go to heaven. Li Ban is shown with arms raised in "orans" or prayer position, praising God for her life, her freedom, and her beautifully wild and verdant environment. Laugh or cry as you wish. Cute otter, though. I like otters. Was it because there were no actual Celtic saints with amazing and inspiring stories that this idiotic tale was composed? Surely not. Indeed! 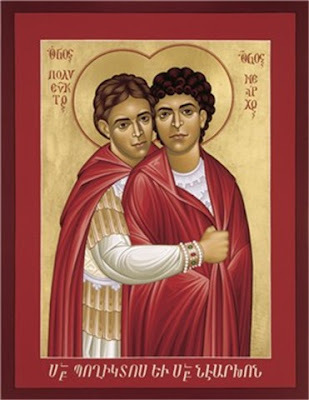 It must be said that the artist who painted this is not Orthodox, but that's still no excuse to take such liberties with iconography, especially when such folks claim fidelity to Orthodox tradition. We have been down this path before and it always leads to the same place. A lack of humility and obedience. Originally, iconography was a monastic endeavor. It was supposed to be a vocation in the church. You were supposed to give up other forms of expression solely for iconography. Few have done that. Lately it has become a side show to one's art career and inner expression. Just a hobby to be taken up without much thought. Look at the cashing in on painting classes everywhere. $700+ to teach non Orthodox how to paint the sacred imagery. But without exposure to Liturgy every week, they pervert the images and make their own statements as if they had the authority. The arguments of "Why can't I?" and "How dare you tell me what to paint?" ring in the ears. We are not going to bend our knee to any authority as we are in charge of our own salvation. We have stacks of books that tell us so. It's sad, and telling about our society and path. 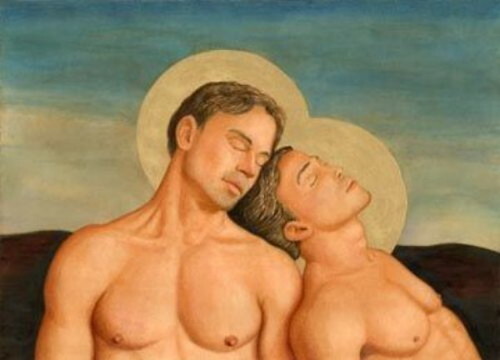 The saddest part is that we quietly accept these perversions of iconography as versions of the truth. The uninformed and uninspired current Orthodox accept false images and display them unknowingly. We open our mouths and speak with authority without the ancient knowledge to support us. We walk in error and repeat that error many times over. That's the stupidest story I've ever heard. Just for that, I'm going out tomorrow and punching an Irish person. Preferably Bono. What's wrong with "Muslim artistic styled mixture thing"? 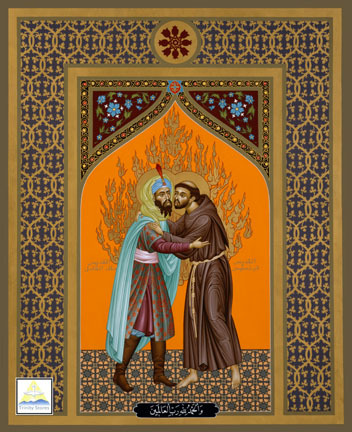 If it had Orthodox Saints instead of Francis and Caliph (?) I could perhaps venerate it. What is up with the Prosopon School? I just watched "21 Jump Street" this past weekend and seeing this made me giggle a bit. When i'm watching this, I remember that incident with the Harry Potter icon. This image of God the Father, Christ and the Holy Spirit is a variant of the NT Trinity. Not only is God the Father shown as an old man, but the Holy Spirit is shown as a winged angelic figure, a form the Spirit has never manifested as. 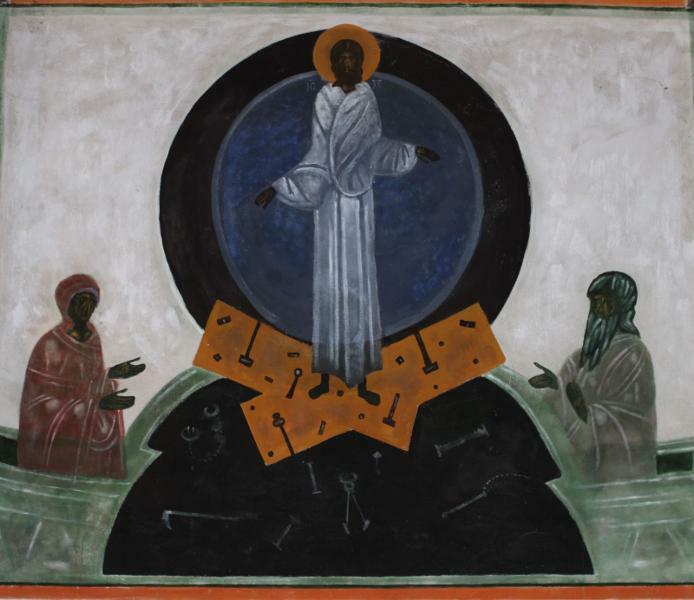 The Spirit has appeared in the form of a dove, as fiery tongues, and as the cloud of uncreated light surrounding Christ at His Transfiguration, but never in the form in this "icon". Setting aside the uncanonicity of God the Father as an old man for a moment, while St Anna, together with her husband St Joachim, are liturgically referred to as “holy venerable forebears of God”, this does not mean that St Anna is on an equal theological footing with God the Father. 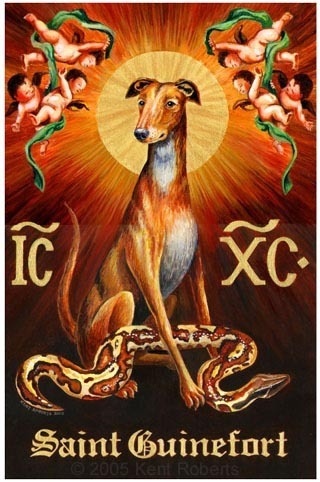 This school has a particular fondness for painting Holy Wisdom and related images, which have, again, been denounced by the Church more than once as expressing an incomplete and defective theology, of denying the fullness of the Incarnation. This image goes further with the Holy Silence theme, by adding a star on the forehead and shoulders of the angel (as would be the case with icons of the Mother of God); and placing Christ Emmanuel over the angel’s body in the manner of Of the Sign icons. Did this virgin angel conceive and bear a son, called Emmanuel? To add to this theological confusion, there is a medallion of Christ’s face above the angel. In icons of the Hospitality of Abraham, and in St Andrei of Radonezh’s Holy Trinity, the vessel in the foreground, containing a calf’s head, prefigures the sacrifice of the Son of God, and the Eucharistic chalice. In this “creative” twist on accepted iconography, the incarnate Christ Emmanuel is seen inside the vessel, with the inscription Lamb and Logos on either side of Him. More theological and Trinitarian confusion. It is of great concern that the classes this school provides are very popular. 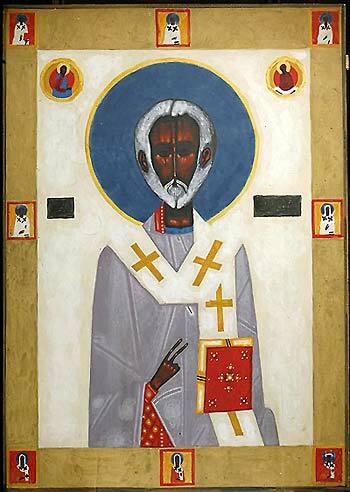 For an iconographer, acquiring skill in painting technique is necessary, but, more important is acquiring a thorough knowledge of what should and should not be painted. It is essential that teachers of iconography are vigilant against the propagation of suspect and uncanonical images. 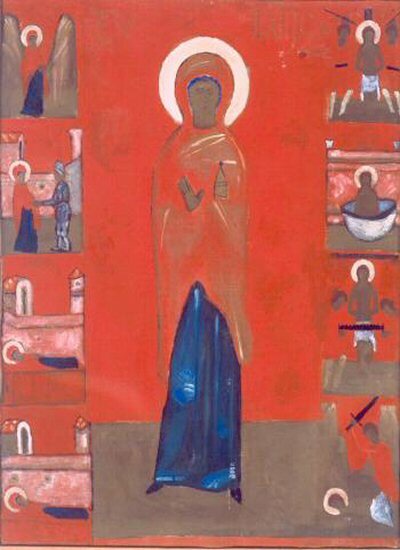 It is acceptable for an iconographer to paint icons of canonical content, even if his skill is not polished. 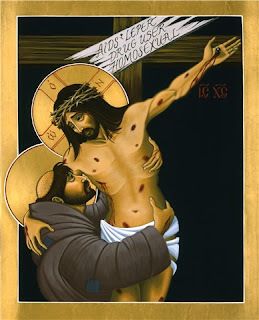 It is unacceptable for him to paint images with a masterly technique, but whose content goes against Orthodox doctrine and theology. "Neither unborn children don't make it that did not live one day." Also, I still don't get the thing in that icon, with the children on the playground. Now along with my obsession with non-canonical/fake apostolic churches, I have to add schlock icons to my list of sicknesses that consume nights when I cannot sleep but have access to Google. Thanks a lot. There's a difference between "rustic but powerful and moving", and "badly painted, with little sense of draftsmanship, which does little to evoke a prayerful attitude, but is more reminiscent of folk art". Having said that, the one which is just passable is the last one of the female saint; the blue halo around the bishop-saint makes no sense at all (if gold is unavailable, then a pale color reminiscent of light can be chosen - the artist used a golden shde for the crosses on the omophorion, so why didn't he use the same in the halo? ); and the Resurrection leaves out a lot of important theological detail, not even showing Christ pulling Adam out of the grave, surely a glaring omission in even a minimalist composition like this. The scene with Mom and Dad in the playground with their tribe of little ones is inscribed The Blessed Family. Another detail in this image which seems to have been lost on the artist who painted it: In icons, saints or other figures are frequently shown with a hand extended as a gesture of homage and supplication, and, in the case of the Mother of God, her gesture has two meanings: supplication, and showing her Son to be the way of salvation. The sorrowful angel at the top of the composition is gesturing towards the abortionist and the dragon. Oops. That icon confused me at first since I've never seen the Father's old man halo like that. The "ho on," specifically. All of the old man Father icons I've seen have a starkly different halo than Christ's. Not only has the Holy Spirit never manifested as a winged angelic figure, but this winged angelic figure has been used to represent Holy Wisdom (uncanonical imagery, but let's set that aside for now). This Holy Wisdom figure is supposed to represent Christ before His Incarnation, not the Spirit. Furthermore, showing this figure in Christ's lap also speaks of Wisdom itself being a hypostasis of God, a person, not simply an attribute of Christ. This is completely contrary to Trinitarian theology. From the Soviet Realist School of iconography? Nothing like Soviet Realism, my friend - the complete opposite. More like naive art, and not particularly well-painted, either. Well, it was sort of an ironic comment. I could imagine those frescoed on drab concrete walls. Who drew (not wrote, because it is uncanonical) this Image? Why do these have to exist? The word for "write an icon" and "paint an icon" is the same in Greek. "Writing" doesn't make it more holy and is a silly american thing. As an EO I admit we helped it catch on.